Wild cats prowl around the bird feeder outside Mark Smith's home, waiting to pounce on a wren or maybe a robin. About all Smith can do right now is watch. But if the La Crosse firefighter has his way, there will soon come a day when he can open his door, take aim and fire — and not worry about being prosecuted. Smith, 48, wants Wisconsin to declare free-roaming wild cats an unprotected species, just like skunks or gophers. Anyone with a small-game license could shoot the cats at will, legally. His proposal gets tested April 11 at the Wisconsin Conservation Congress spring hearings, where outdoor enthusiasts gather in every county to vote on hunting and fishing issues. The citizens' advisory group then will forward the election results to the state Natural Resources Board. The Legislature would have to change the law, though, for Smith's plan to be implemented. At least two other upper Midwestern states, South Dakota and Minnesota, allow wild cats to be shot — and have for decades. Minnesota defines a wild, or feral, cat as one with no collar that does not show friendly behavior, said Kevin Kyle with that state's Department of Natural Resources. "People out in the country with problems with them take care of the problem," Kyle said. "I personally picked up the phone at work on four threat calls," Smith recalled about the first days after his idea hit the news. While Smith expected criticism, he didn't expect venom spewed his way for what he considers a reasonable solution to an environmental problem created by irresponsible pet owners. People who get tired of their cats shouldn't be setting them loose in the country, he said. "Maybe I am emotionally inept, but I don't understand the reaction these people are having," he said. "I guess they need to be put in a room with a bunch of these cats." The Humane Society of the United States called Smith's plan cruel and archaic. Humane societies nationwide euthanize 3 million to 4 million cats and dogs each year because they have been abandoned and no one wants them, said Stephanie Shain, a spokeswoman for the Humane Society in Washington, D.C. But there is a difference between killing animals with an injection and letting them die painlessly, and shooting them, Shain argued. 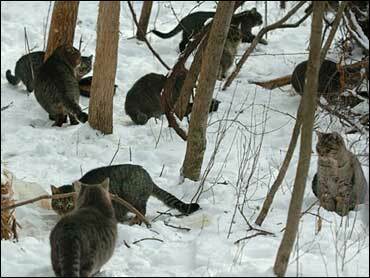 Other critics have organized the Wisconsin Cat-Action Team and are mobilizing cat lovers to attend the hearings later this month. "You don't take on cats. It is one of the most popular companion animals in the world," said Ted O'Donnell of Madison, founder of Cat-Action and owner of five rescued cats. "Why would you propose an idea that would treat that relationship so callously?" O'Donnell's plan is to trap wild cats, spay or neuter them, then release them. Their numbers decrease over time because they're not reproducing so rapidly, he said. Smith, who grew up with Fluffy the cat and now has three dogs, counters with his original points: He doesn't want an open season on all cats and legitimate pets won't be in jeopardy if their owners are responsible. "What is so terrible about putting a collar on a cat to identify it as yours?" he asked. "Are you ashamed of the fact that you are a cat owner? How hard is that?"